Chinese Yam is the swollen rhizome of a yam plant native to China that is also grown in Korea and Japan. The rhizome functions as a storage organ to hold nutrients for the plant. Chinese Yam has a thin yellowish outer skin over its crispy white flesh. The flesh has a blend, slightly sweet taste and can be eaten raw or cooked. 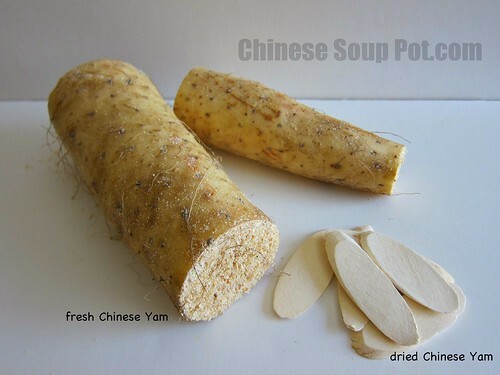 Chinese Yam can be purchased fresh as a vegetable root or dried as an herb. The dried form usually comes in pre-cut slices and are most commonly used in traditional Chinese soups and herbal medicinal soups. The fresh version can be used in a stir-fry or in soups. Slicing a fresh Chinese Yam feels a bit like cutting into the crispy texture of a lotus root. But when cut, the Chinese Yam secrets a slippery mucilage just like okra (“lady finger”) does. In the dried form, Chinese Yam looks and feels much like a powdery white chalk. Chinese Yam is one of the most important and commonly used food remedy in traditional Chinese medicine for generations. The rhizome is known in Chinese herbal medicine to strengthen the lungs, and tonify the Qi, spleen, and kidney. As a food medicine, Chinese Yam is useful in treating poor appetite and diarrhea. It also treats coughs and wheezing caused by lung Qi and Yin deficiencies. Chinese Yam is neutral in nature, which allows it to tonify the Qi without causing heat or injuring the Yin. As a food herb, Chinese Yam is fairly mild and gently tonifies deficiencies over time. When consumed long term, Chinese Yam strengthens the human body and increases vitality. Chinese Yam is an excellent food ingredient for those who are deficient in Yin while needing to strengthen the Qi. See a list of soup recipes using Chinese Yam. To prepare fresh Chinese Yams, rinse under cool water before peeling the outer skin. To prepare dried Chinese Yams, rinse the dried slices quickly under cool water. Do not soak as this will leach away nutrients and weaken the beneficial functions of the herb. Cook dried Chinese Yams for 1.5 – 2 hours in soups. Fresh rhizomes on the other hand only require about 20 minutes of cook time in soups. Fresh and dried Chinese Yams can be purchased in Asian supermarkets. How do you use your Chinese Yam? Leave a comment below to share your ideas.